The NFL needs this. Dr. Gary Small's study on tracking CTE, the central brain disease in former NFL players, has offered proof of its theory in a study published today: It can use PET scans to track the onset of CTE, and maybe save the lives of current and former players. Can Science See Inside An NFL Player&apos;s Skull Before It&apos;s Too Late? Chronic traumatic encephalopathy (CTE) is caused by the buildup of tau proteins. Small's study, a pilot program which we took a close look at last summer, uses a specific PET marker (18F]FDDNP), which attaches itself to tau proteins and amyloid plaques—the two elements necessary to diagnose Alzheimer's. The study found tau in every participant, all former NFL players. 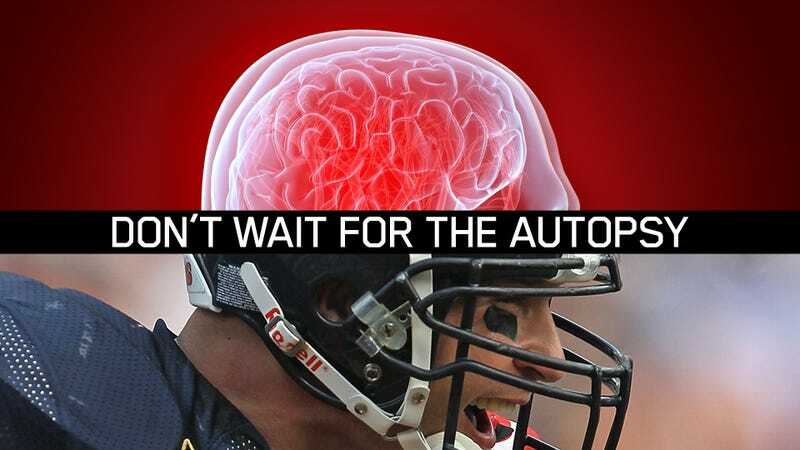 Tau buildup is known to form after repeated blows to the head, even non-concussions, which happen on nearly every play in the NFL. So tracking tau buildup would allow us to see how much damage a player's brain has undergone. To this point, there had been no way to track tau before examining the brain at autopsy. The closest ideas used methods traditionally used on Parkinson's or early onset dementia patients, tracking their cognitive decline. The relatively small sample size of Small's study—five former players—means further testing will be required, but the results are informative: The scans of the former players' heads were in line with the images of a typical CTE-diagnosed brain at autopsy. While this method isn't perfect—it also tracks and cannot differentiate the unrelated amyloid plaques—it is a massive step forward in diagnosing and addressing CTE. CTE itself is a degenerative neurological disease. It causes the onset of dementia, and has been found to affect nearly every former NFL player autopsied after its discovery. After years of straight denials, the NFL has finally acknowledged and begun to address the issue. Its efforts to this point have largely been rules-based, and dubiously effective. Improvement will have to come through science. It's unclear what that would look like, though. Even if the method, or others, were found to work perfectly, it's highly unlikely that a hard and fast cutoff would be implemented. More probably, data gathered would be used to reverse engineer statistics about who is most at risk, broken down by position, length of career, play style, genetic composition, and other factors.